FOLK holds work parties throughout the year on the second Thursday, third Tuesday and fourth Sunday of each month. We meet at Daisy Bank car park at 9:30 am and each session last for about 3 hours. The dates for the next few work parties are shown opposite. The dates for future work parties, and a map showing the location of the meeting point, can be accessed via our Programme page. All are welcome to join the work parties, there are tasks to suit all levels of fitness and strengths. You don’t have to be a member of FOLK to join a work party. Do come along and try it. We are a mixed and sociable group of volunteers. We will make you welcome. FOLK provides all the tools that will be needed for each work party. We just ask that volunteers wear sensible clothes (long trousers and long sleeve tops are recommended), including stout footwear, and to bring tough gardening gloves. 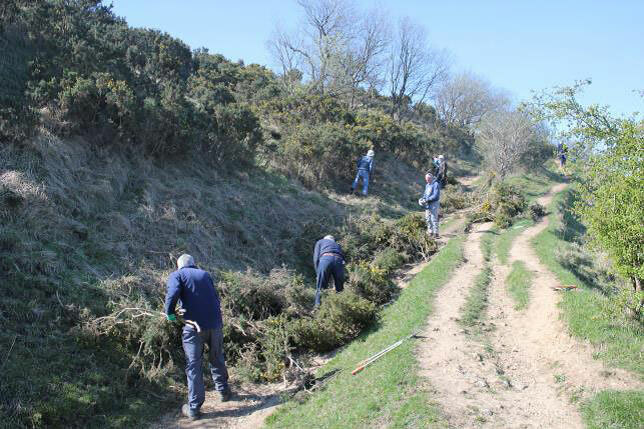 The site does have slopes, and potentially uneven or slippery surfaces, which we work on and we can be handling prickly materials such as bramble, hawthorn and gorse. FOLK work parties are covered by public liability and personal accident insurance. Due to the hazards arising from the use of sharp tools the work parties are not suitable for young children (or dogs) to attend. What do we do on Work Parties? We often talk about working in various numbered areas. These are indicated in this plan of the Hill and Common. We have a varied range of tasks we do throughout the year which are mainly aimed at conserving the site and protecting its important features. 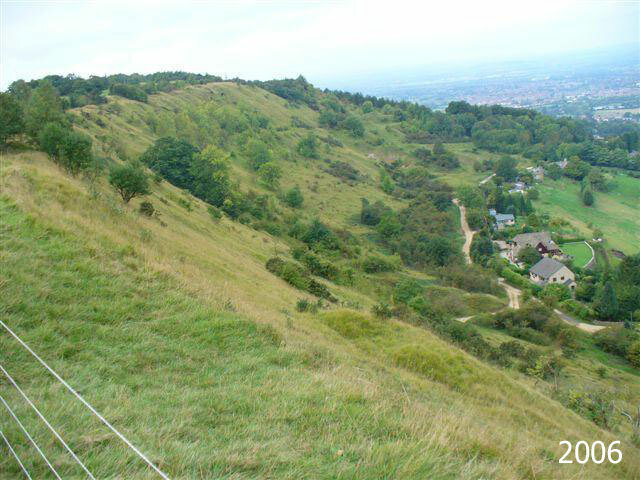 In developing our work programme we work closely with Cheltenham Borough Council, the owner of the site, and Natural England who advise on and monitor the site. 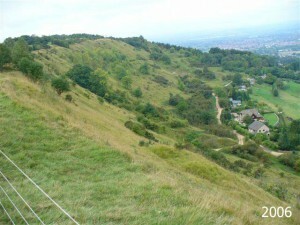 A key feature of the site, and the main reason why it is classified as a Site of Special Scientific Interest (SSSI), is the unimproved limestone grassland which is continually threatened by the invasion of scrub and saplings. If this invasion was left unchecked then it would eventually cover the whole of the site, ruin the grassland and restrict public access. 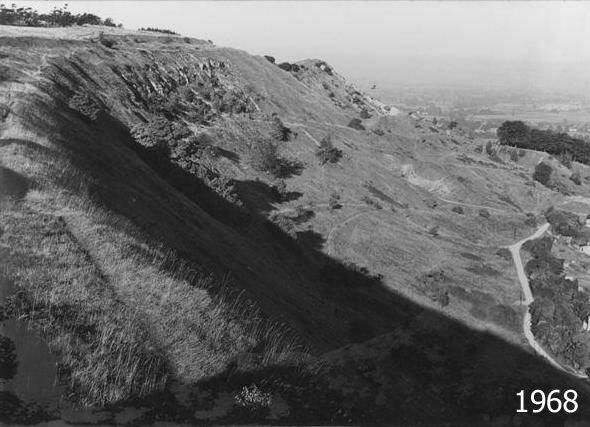 It is surprising to see old photos of the Hill and Common and how little scrub and trees there were as compared to today – see below. We therefore spend quite a bit of time, particularly in Autumn and Winter, clearing scrub and burning the cuttings. 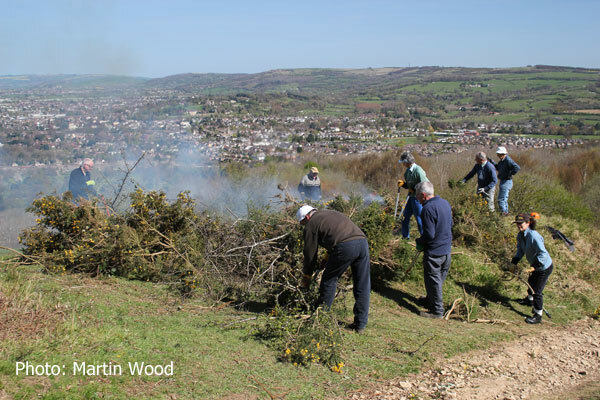 In Spring and Summer, when we avoid large-scale cutting of scrub to minimise disruption to nesting birds, we do tasks such as footpath maintenance and the removal of invasive weeds, e.g. hemp agrimony and ragwort (which is dangerous for the cattle). We also do work associated with the historical features on the site, e.g. ensuring that the iron-age hillfort and limekiln ruins don’t become overgrown and hidden from view. As necessary, we install temporary fencing either to protect certain plants or trees from grazing by the cattle or deer, or to restrict the cattle, calves or sheep to particular areas for short periods. In addition, and complimentary to our FOLK work parties, others also do work on the Hill and Common, e.g. Cheltenham Borough Council contractors and the Cotswold Voluntary Wardens. We will sometimes work alongside or in association with them. The tools that we mainly use are hand-tools such as loppers, saws, forks and rakes. We do have two motor-driven brushcutters and a powered all-terrain mower which volunteers can use following suitable training. What is planned or been done recently? If you would like to read about what is planned for the next work party, or has been done on recent work parties, then please follow the link below. 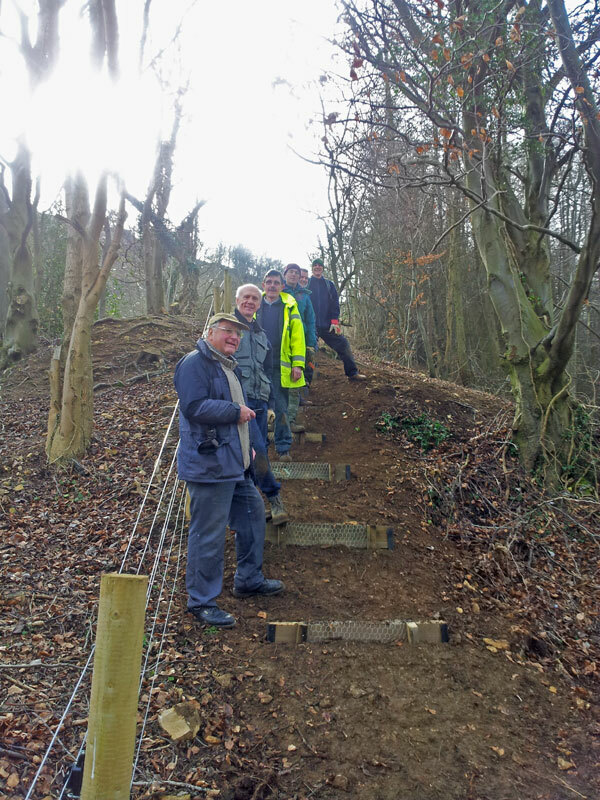 Although we are all volunteers and not a formal body of workers, health and safety on our work parties is important. To read more about this, please follow the link below.